Chigasaki, Japan, Apr 19, 2018 - (JCN Newswire) - ULVAC, Inc., the global leader in vacuum technologies and solutions, announces the LS Vacuum series, a range of dry vacuum pumps with high pumping speeds and low power consumption. The LS range provides high pumping speed at near atmospheric pressure, thereby shortening pumping down time. Dry vacuum pumps are used in many production lines, including those for electronic parts and displays, for reasons including low power consumption. However, typical dry vacuum pumps with low power consumption tend towards long pumping down time, as they have low pumping speeds near atmospheric pressure. ULVAC developed the LS Vacuum series, which combines high pumping speeds with low power consumption, by increasing pumping speeds at near atmospheric pressure, shortening pumping down time. The LS Vacuum series offers high pumping speeds together with ULVAC's unique technologies for reducing power consumption. 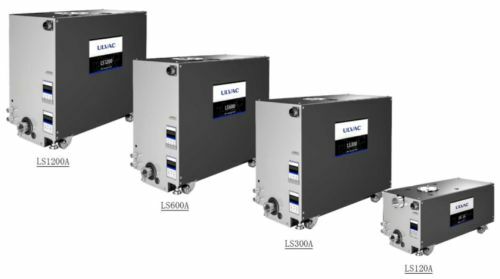 The LS Vacuum series lineup includes 4 dry vacuum pumps with pumping speeds ranging from 120 to 1200 m3/h (LS120A, LS300A, LS600A and LS1200A). Customers can select a pump with an exhaust capacity optimized for the size and usage conditions of their equipment. The LS Vacuum series exhibits high pumping speed near atmospheric pressure, thereby shortening pumping down time (by approx. 20% compared to typical dry vacuum pumps with low power consumption). While realizing high pumping speeds, the LS series achieves the industry's lowest power consumption of no more than 0.6 kW while reaching ultimate pressure. The specialized built-in silencer reduces the noise level to no more than 61 dB (A). ULVAC, founded in 1952, contributes to the development of industry through its comprehensive vacuum technologies. We created ULVAC SOLUTIONS based on these unique technologies and long years of research, development and production innovation. We offer these solutions, for equipment, materials, vacuum components, analytic evaluation and various other services, to manufacturers of electronic components, semiconductors, solar cells, flat panel displays and other industrial equipment. For more information, please visit www.ulvac.co.jp/en/. The LS Vacuum series, from front: LS120A, LS300A, LS600A and LS1200A.